This is the ProTek R/C 250T Digital Hi-Torque Metal Gear High Voltage Helicopter Cyclic Servo. 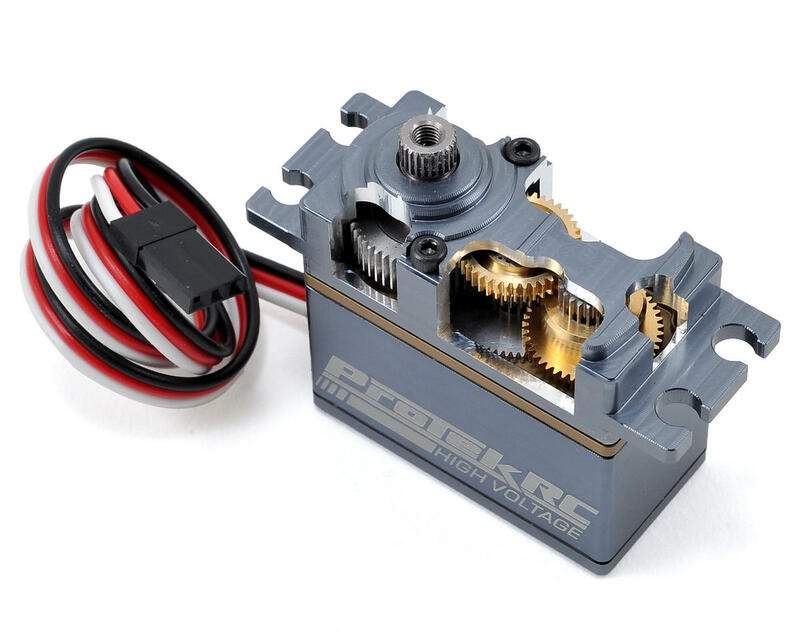 ProTek R/C Servos have been developed to provide enthusiasts with high quality servos that will exceed your expectations at every level. With features that meet or surpass what our competition can provide, ProTek R/C servos deliver performance and unmatched value, with industry leading customer support. 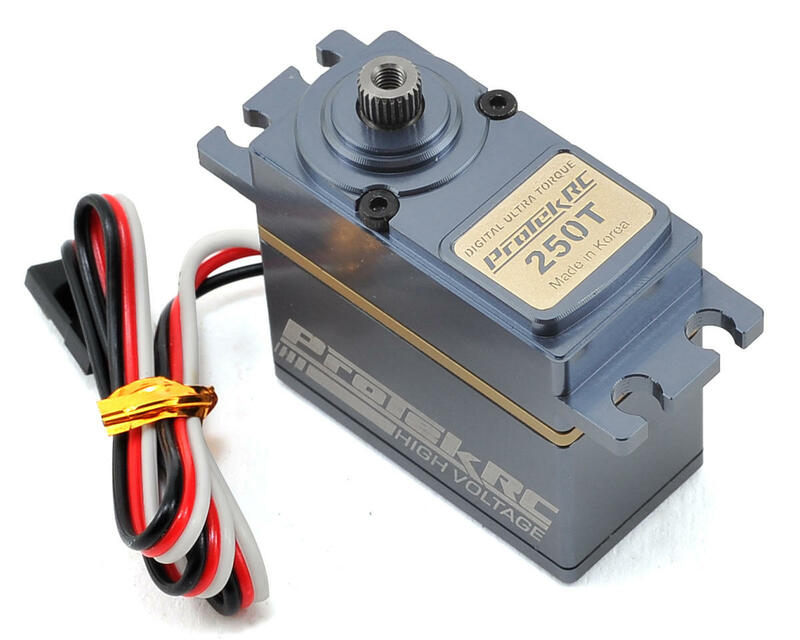 The ProTek R/C 250T High Voltage Cyclic servo delivers an incredible 299 oz-in of torque and 0.09 transit speed at 6.0V, and when you bump the voltage to 7.4 the specs increase to 369 oz-in and 0.07! Other features include a full aluminum case that provides bomb proof durability and improved heat dissipation, a metal gear train that is supported by dual ball bearings, a 200mm long 22awg connector wire with gold plated connectors, and a coreless motor. 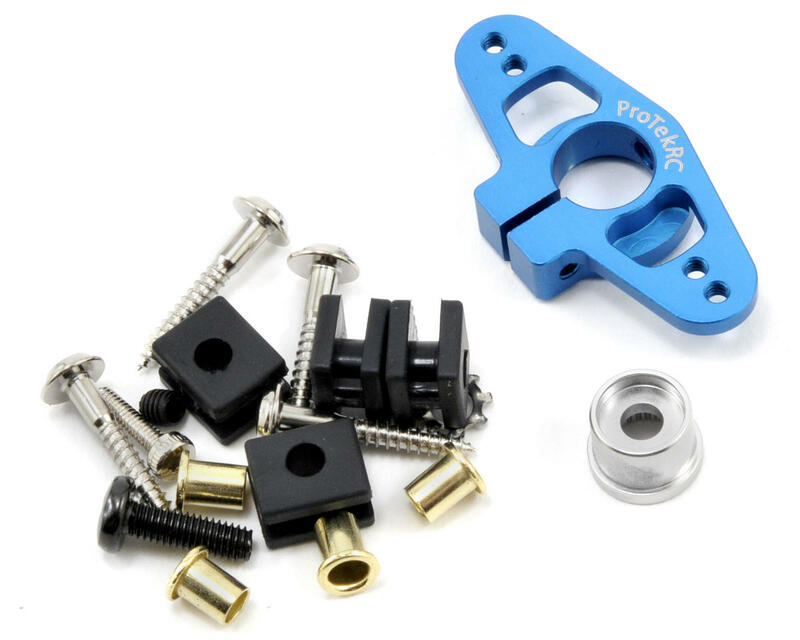 Plus, instead of a cheap plastic servo horn, ProTek R/C goes the extra mile with an included aluminum clamping style double arm servo horn that will stand up to a majority of the punishment you can throw at it. Stop wasting your money on budget servos that look good in the spec list, but fall short when its time to perform. Get ProTek and don't look back. 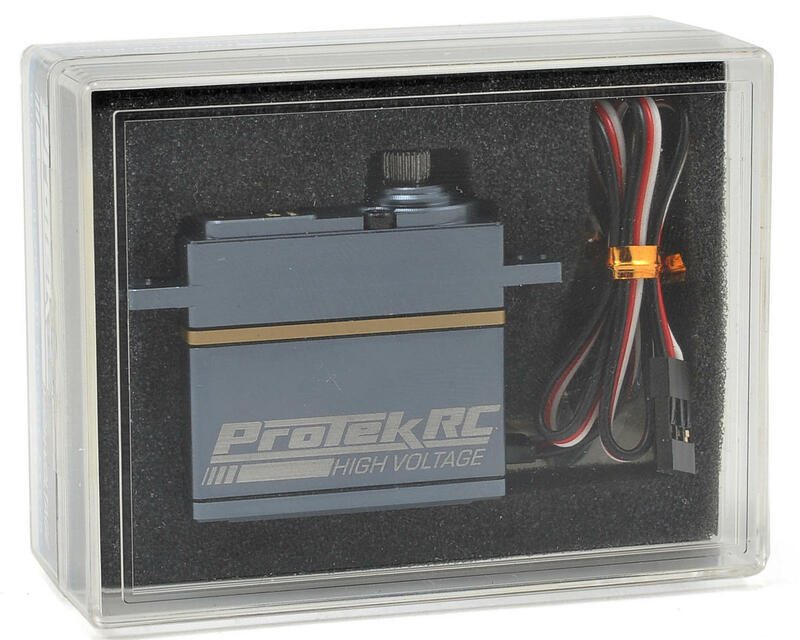 Notice: ProTek R/C helicopter servos may require an isolated power source or the use of a high-amperage power regulator, like the PTK-4000. Like many of other leading helicopter servo lines, the high torque and speed specs of ProTek R/C helicopter servos also mean that these units can generate high-frequency noise on the power lines, which can interfere with the proper operation of some flybarless systems and receivers. We have confirmed this issue exists with the MSH Brain, iKon, newer Vbar Silverline, and the Spartan VX1 and VX1n. Our lab tests indicate older VBar units and the BeastX are far less susceptible to interference and should work well with ProTek R/C servos, even without a power regulator or isolated power source. We strongly recommend running two separate power sources (i.e., one battery for the servos and another for the flybarless systems) as the best way to eliminate any possible interference. An alternative approach is to use a power regulator to filter the power bus between the servos and flybarless system. In order to do so, you must run it in regulator (not bypass) mode. As today’s servos push the limits of speed and torque specs, flybarless systems need to evolve similarly. Nevertheless, we are aggressively pursuing design changes and power isolation/regulation accessories that will broaden the compatibility of our helicopter servos, while maintaining the leading level of performance you’ve come to expect from ProTek R/C. I have flown just about every servo out there and I have to say, Anything that can take the abuse of Tim Jones deserves a second look. I bought my first set of these Servo's after Tim showed me his helicopter at an Event. I have never seen a servo that with power on you cant twist the blade grips much less get any servo distress. These things Rock and Proof is in the pudding based on the fact they stay out of stock. I strongly recommend you getting on the Back Order List if your not already. Order a set today from A Main Hobbies, you wont regret it.. 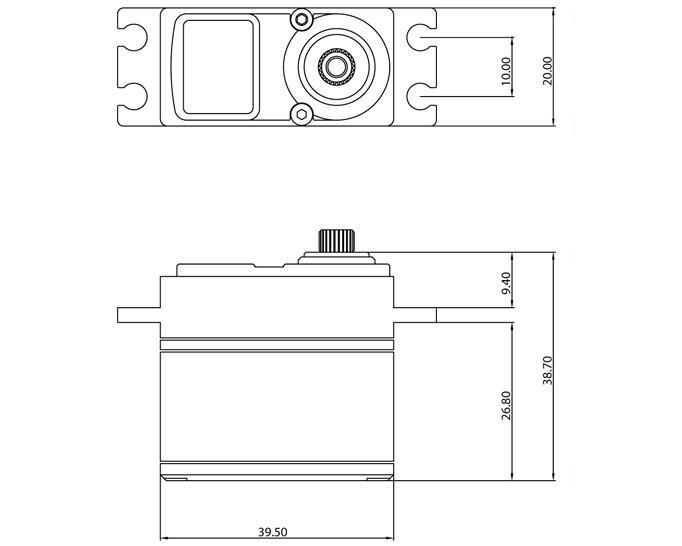 Very good servos, very quite at the bench, aluminum case with a high quality finish, high in torque and speed. Just use a 2S Lipo and you are ready to go. Flew for more than 15 flights till date with no issues.